Zagreb is the cultural, scientific, economic, political and administrative center of Croatia. Surnamed the "city of museums" as there are more of them per square foot than any other city in the world, Zagreb is also a vibrant destination with a variety of modern shops, quality restaurants and sports/recreational facilities. The historical part of the city to the north of Ban Jelaèiæ Square is comprised of the Upper Town and Kaptol, a medieval urban complex of churches, palaces, museums, galleries and government buildings that are exceptionally popular with tourists on sightseeing tours. Stunning Dubrovnik is aptly surnamed the `Pearl of the Adriatic;` it is one of the most beautiful cities on the Croatian coast. Many buildings in the old city center testify of its glorious past and its Venetian influence. The ancient walls of Dubrovnik girdle a perfectly preserved complex of public and private, sacred and secular buildings representing all periods of the city`s rich history, beginning with its founding in the 7th century. In 2019, Dubrovnik celebrates 40 years of being listed on UNESCO`s register of World Heritage Sites. 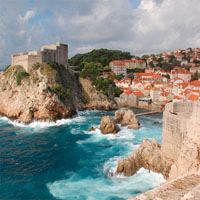 Nowadays, Dubrovnik is a tranquil touristic and cultural center hosting many musical, art and theater events year round. Split is the second-largest city in Croatia, and its history stretches back over 1,700 years. The Roman Emperor Diocletian built his lavish retirement palace here. It is the largest and best-preserved example of a Roman palace left in the world, and it is listed on the register of UNESCO World Heritage Sites. 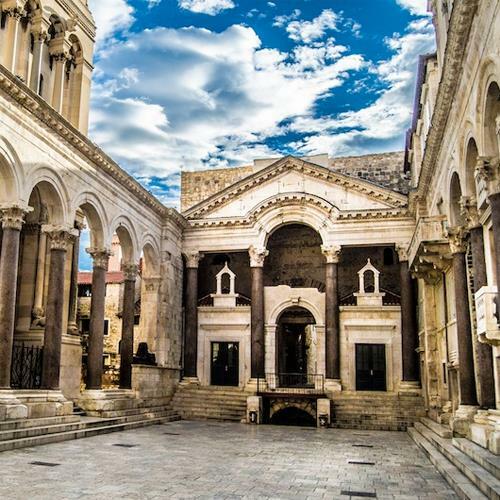 Diocletian`s Palace is the gem of the Old Town, a pedestrianized zone which includes the beautiful riverwalk called Riva. It could not blend tradition and modern life more perfectly; buzzing shops, restaurants, and bars are situated alongside monuments and buildings dating from the Roman era. The dramatic backdrop of mountains bleeds into the sea, giving an atmospheric setting to this stunning city. Split`s Old Town, Diocletian`s Palace, Bacvice, Marjan, Mestrovic Gallery, Klis Fortress, Diocletian`s Palace, Riva, Gregory of Nin statue, Chapel of St. Arnir, Diocletian`s Cellars, Peristyle, Republic Square, People`s Square, and so much more! One of the best stops on the Dalmatian coast, Trogir is a living museum, the best-preserved Romanesque-Gothic complex in the Central Europe. Its medieval core, surrounded by walls and comprising a magnificient castle and tower and a series of dwellings and palaces from the Romanesque, Gothic, Renaissance and Baroque periods, is part of the UNESCO World Heritage. One of the most impressive buildings is the church of St. Lawrence, whose main west portal is a masterpiece by Radovan, and the most significant work of the Romanesque-Gothic style in Croatia. Dating back from roman times, Zadar is a city with a long tradition and a rich cultural heritage. The town is fortified with thick walls, renowned for their impressive ports, such as the Harbor Port and the Mainland Port, which date back to the sixteenth century. Zadar's most impressive sight is the pre-Romanesque Church of St. Donatus. The town is also famous for having the most beautiful Romanesque churches in Croatia, such as the Cathedral of St. Anastasia, the Church of St. Chrysogonus and the Bell-tower of St. Mary. Brac is the third largest island in the Adriatic. Thousands of tourists are drawn each year by the beautiful beach Zlatni rat, located in Bol, on the south side of the island. This is the only beach that changes its shape from day to day. On this island you will also find the highest peak of all Croatian islands - Vidova Gora (778 m). 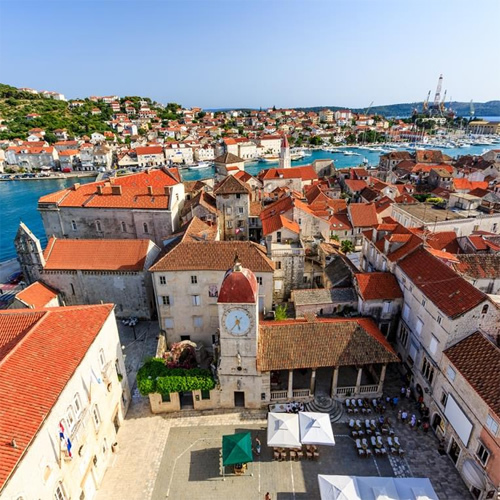 You will be charmed by the variety of the architectural styles of the island's towns: pre-Romanesque style churches, Croatian architecture with Romanesque features, Renaissance, Baroque-style architecture and modern constructions. Split is the second-largest city in Croatia, and its history stretches back over 1,700 years. The Roman Emperor Diocletian built his lavish retirement palace here. It is the largest and best-preserved example of a Roman palace left in the world, and it is listed on the register of UNESCO World Heritage Sites. Diocletian`s Palace is the gem of the Old Town, a pedestrianized zone which includes the beautiful waterfront called Riva. To many travelers, Split is often seen as a hub for discovery of nearby islands and other Croatian cities, but with Diocletian`s Palace as a hub, Split welcomes millions of visitors each year in its own right. It could not blend tradition and modern life more perfectly; buzzing shops, restaurants, and bars are situated alongside monuments and buildings dating from the Roman era. The dramatic backdrop of mountains bleeds into the sea, giving an atmospheric setting to this stunning city. Discover for yourself why Croatia has been named a top tourist destination for years! Combine Dubrovnik and Split with a quick flight between cities. There is no shortage of parks, historic sights or activities to explore in these fascinating cities. This is a flexible vacation package. Select your number of nights in the city, desired hotel and activities. Travel throughout Croatia with this customizable rental car package. Start in Split (an exuberant, buzzing city with a perfect balance of history and modern sensibilities) and continue to Zagreb (a vibrant destination with modern shops and fascinating museums). This is a flexible vacation package. Select your number of nights in each city, desired hotels and activities. Discover for yourself why Croatia has been named a top tourist destination for years! Combine Dubrovnik and Split in true Croatian style, travelling by ferry. The historic significance, art, culture, and food in these beautiful Adriatic cities is out of this world! This is a flexible vacation package. Select your number of nights in the city, desired hotel and activities. Take a trip to Europe and witness Croatia like never before seen. Begin in Zagreb (a vibrant destination with modern shops and fascinating museums) and then drive to Split (an exuberant, buzzing city with a perfect balance of history and modern sensibilities) and continue to Dubrovnik (the pearl of the Adriatic; with sun-drenched beaches on one side and imposing mountains on the other). This is a flexible vacation package. Select your number of nights in each city, desired hotels and activities. Venture through Croatia like never before, visiting three of its most memorable cities. 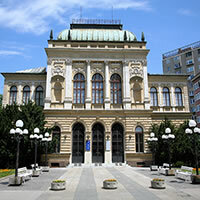 Begin in Zagreb (a vibrant destination with modern shops and fascinating museums.) and take a train to Split (the second largest city of Croatia, known for its beaches and the fortress like complex at its center, Diocletian`s Palace, erected by the Roman emperor in the 4th century.) and then finally hop a flight to Dubrovnik (known as the `Pearl of the Adriatic` for its stunning beauty). This is a flexible vacation package. Select your number of nights in each city, desired hotels and activities. The cultural and historic highlights as well as natural beauty of Dalmatia will be revealed to you in its greatest splendor onboard the MS Karizma. Enjoy total relaxation among intact medieval coastal villages and towns, numerous islands, hidden coves and the pristine crystal clear waters of the Adriatic Sea. Set forth on an unforgettable adventure, exploring Croatia like never before. Start this journey in Zagreb (a vibrant destination with modern shops and fascinating museums) and then drive to Zadar and continue to Split and then to Dubrovnik (the pearl of the Adriatic; with sun-drenched beaches on one side and imposing mountains on the other). This is a flexible vacation package. Select your number of nights in each city, desired hotels and activities. An escorted motorcoach visiting stunning Belgrade, Cetinje, Dubrovnik, Split, Plitvice Lakes, Postojna Cave, Bled, Ljubljana and Zagreb. Relax and enjoy as all the details are handled for you! See the beautiful coast of Dalmatia with this totally flexible vacation package. Croatia is rapidly growing in tourism, and for all the obvious reasons! The scenery is idyllic, the people are friendly and the food is out of this world. Try it all and see it all here with a combination of the most popular destinations; Dubrovnik (the pearl of the Adriatic; with sun-drenched beaches on one side and imposing mountains on the other), Hvar Island (with traffic-free marble streets and Gothic palaces inside a beautiful walled city center), and Split (an exuberant, buzzing city with a perfect balance of history and modern sensibilities)! This is a flexible vacation package. Select your number of nights in the city, desired hotel and activities. Ferries/hydrofoils for the Islands only operate between May 23rd and September 9th due to weather conditions. Visit the highlights of the Croatian coast and other nearby gems; stay in Dubrovnik, Split, Plitvice Lakes, Bled, Ljubljana and Zagreb. Croatia is at your feet, waiting to be explored. See Croatia like never before by visiting three of its cherished cities. Begin this adventure in Dubrovnik (the pearl of the Adriatic; with sun-drenched beaches on one side and imposing mountains on the other) take a ferry to Korcula Island and finally a take a ferry to Split (an exuberant, buzzing city with a perfect balance of history and modern sensibilities). This is a flexible vacation package. Select your number of nights in the city, desired hotel and activities. Journey through Croatia like never before visiting three of its cities. Begin in Dubrovnik (known as the `Pearl of the Adriatic` for its stunning beauty). and then take a flight to Zagreb (a vibrant destination with modern shops and fascinating museums.) 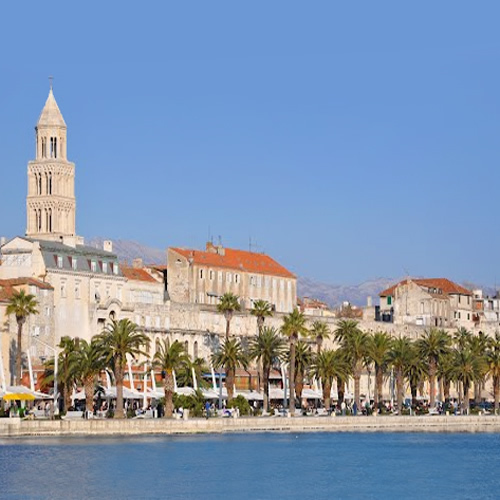 and finally take a train to Split (the second largest city of Croatia, known for its beaches and the fortress like complex at its center, Diocletian`s Palace, erected by the Roman emperor in the 4th century.) This is a flexible vacation package. Select your number of nights in each city, desired hotels and activities. Take a once in a life time adventure, journeying through Italy, Slovenia and Croatia with this customizable package. Start your adventure in Dubrovnik (known as the `Pearl of the Adriatic` for its stunning beauty) and then hop a flight to Split (a picturesque town with a lovely castle, cathedral and a few very interesting museums) then take a train to Zagreb continuing via train to Ljubljana and then take a train to Italy and see Venice (the romantic city set on canals, the backdrop for Edgar Allen Poe`s tale The Cask of Amontillado). This is a flexible vacation package. Select your number of nights in each city, desired hotel and activities. Take Croatia into your own hands, travel between the most popular cities with a rental car. Start in Dubrovnik (known as the Pearl of the Adriatic, this stunning city on the coast has Venetian influences and several musical, art and theater events), then drive to Split (a picturesque town with a lovely castle, cathedral and a few very interesting museums), Zadar (an impressive pre-Roman settlement known for their ports), Opatija and Zagreb (the cultural, scientific, economic, political and administrative center of Croatia; a vibrant destination with modern shops, restaurants and recreational facilities). This is a flexible package. Select your number of nights in each city, desired hotel, rental car and activities. See three of Croatia`s unforgettable cities with this customizable package. Begin in Zagreb (a vibrant destination with modern shops and fascinating museums.) and take a flight to Split (the second largest city of Croatia, known for its beaches and the fortress like complex at its center, Diocletian`s Palace, erected by the Roman emperor in the 4th century.) and then finally hop a flight to Dubrovnik (known as the `Pearl of the Adriatic` for its stunning beauty). This is a flexible vacation package. Select your number of nights in each city, desired hotels and activities. Make the most of your vacation package through Europe! Combine Dubrovnik and Split with a rent a car. There is no shortage of parks, historic sights or activities to explore in these fascinating cities. This is a flexible vacation package. Select your number of nights in the city, desired hotel and activities. Experience this once in a life time adventure in Croatia with is Customizable package. Begin in Dubrovnik (known as the `Pearl of the Adriatic` for its stunning beauty). and then take a flight to Zagreb (a vibrant destination with modern shops and fascinating museums.) and finally take a flight to Split (the second largest city of Croatia, known for its beaches and the fortress like complex at its center, Diocletian`s Palace, erected by the Roman emperor in the 4th century.) This is a flexible vacation package. Select your number of nights in each city, desired hotels and activities. Combine beautiful Dubrovnik (Pearl of the Adriatic), picturesque Split (Diocletian`s palace), Zadar (dating from Roman times) and Zagreb (City of Museums) with rent a car. Croatia is at your disposal, offering three cities in this customizable vacation package. Begin in Split (an exuberant, buzzing city with a perfect balance of history and modern sensibilities) and then drive to Plitvice (a part of Croatia filled with magestic lakes and enchanting forestry) and then continue to Zagreb (a vibrant destination with modern shops and fascinating museums). This is a flexible vacation package. Select your number of nights in each city, desired hotels and activities. Visit three of Croatia`s astounding cities with this customizable package. Start this journey in Split (an exuberant, buzzing city with a perfect balance of history and modern sensibilities) then take a ferry to Hvar Island (with traffic-free marble streets and Gothic palaces inside a beautiful walled city center) and finally a second ferry to Dubrovnik (the pearl of the Adriatic; with sun-drenched beaches on one side and imposing mountains on the other). This is a flexible vacation package. Select your number of nights in the city, desired hotel and activities. We certainly selected the right hotels. This is my fourth trip with europeadestiations.com. I have enjoy every trip. great price , great accomadations,easy to customise. Thank you.